What is Risk Management? | Pure Financial Advisors, Inc. If you’d like to understand what risk management entails, a good starting point is to define risk itself. Put simply, risk is the possibility of loss. We experience risk in a variety of forms in our everyday lives. We risk losing additional time if we take an alternate route to work. We risk missing out on positive outcomes when we opt not to participate in certain activities. If we engage in activity that is dangerous such as extreme sports, we may even risjasonk our health or lives. The decision to take risk and accept the possibility of loss is usually not done for its own sake. We hope to achieve something by doing so. Let’s call this a “return.” You’ll notice if you think of the risks you take in your day to day life that the ones with the highest possibility of loss may also have the highest possibility of return. We could generalize and say that we’d like to get paid for risk we take. You might be willing to risk a speeding ticket to be on time for an interview for your dream job, but not to catch the closest showtime of the new summer blockbuster at your local theater. In short, there needs to be a big enough payoff to accept the level of risk. Investment risks are like other risks we take in the world. We can certainly avoid the risk entirely by not engaging in the activity. Yet when we decide to accept the risk, we choose to manage it to reduce the potential loss we may experience. There are several ways that investors can manage risk. Before we discuss each, it’s important to mention that these are strategies to manage risk, not to eliminate it. It’s also important to understand that there may be tradeoffs associated with each strategy. The decision to limit your floor might also limit your ceiling. That said, the reduction of risk associated with the following strategies can often make one or more of the following strategies as powerful tools for consideration. We should also understand that the overall investment philosophy (active vs passive management, for example) will have implications related to the specific ways in which risk is managed. Your asset allocation decision is one of the most important investment decisions you can make – even more important than specific timing decisions and which investments you select within asset classes. Two people with different asset allocations have various levels of risk in their portfolios and will likely experience different returns. Take one investor with a 50/50 mix of stocks and bonds and another investor with a 70/30 mix. They have different asset allocations. Another investor with a 40/30/30 allocation among stocks, bonds, and real estate has yet another allocation. The decision on your overall allocation is more important than the more specific decisions you may make once your allocation is chosen. If all three of the example allocations included stocks of an auto manufacturer, pharmaceutical company, and a commercial bank, the fact that all three investors chose different companies fitting that description would likely have less of an effect on their return than the overall asset allocation decision. This is the case because specific assets within the same asset class are often highly correlated with one another; meaning they often move in a similar direction in response to various market data. Different asset classes are often substantially less correlated. A test of this that will make intuitive sense is to follow a television or internet ticker displaying a variety of stocks for several days. You’ll eventually notice that for many days, most stocks are up and for many days most stocks are down. Of course, some do better or worse than others, but the asset class as a whole has a general direction. When you own multiple asset classes that are not heavily correlated with one another, you reduce your portfolio risk. The act of diversification is often referred to as the only “free lunch.” This isn’t entirely true since the cost of diversification, like any risk management strategy, is that the upside may be limited in addition to the downside. It’s safe to say, at a minimum, that diversification is a meal that can be had for a deal. The reduction of risk for the difference in expected return is a good trade-off that most investors should consider. Imagine you have a single asset, such as stock in your favorite company, for example. You are optimistic about the prospects the company has and excited to watch it become a profitable investment, but you have metaphorically put all your eggs in one basket. Now imagine that you invest the same amount of money but purchase stock in five different companies. You’ve substantially lowered the amount of risk you’re taking. You’ve specifically reduced your business risk, the risk associated with that company. However, you still have the risk of the overall market since you are invested in five stocks. You’ll also want to consider diversifying not just within asset classes but among asset classes as discussed in the topic of asset allocation. Dollar cost averaging is a terrific way to reduce timing risk, which is the risk that the right investment may have been purchased at the wrong time. When you purchase your entire investment at once, you risk purchasing at a point that may be just before a downturn or when the price is otherwise not advantageous. By dollar cost averaging, you reduce your timing risk and potentially put a strategy in motion that naturally reduces the cost of your investment over time. When you dollar cost average, you are investing a flat number of dollars with each investment rather than buying a specific number of units in the investment you’ve chosen. For example, instead of buying a certain number of shares once a month, you might invest $100 into your mutual fund of choice, for example. This difference is important because investing a specific dollar amount means that you are automatically buying a greater number of shares when the price is low and fewer shares when the price is high. Dollar cost averaging makes it a little easier to stomach a slightly volatile market since you’ll know that a generally rising market with fluctuation along the way is better for you than a straight line upward. Hedging is a term that investors hear frequently but one that is often misunderstood. To fully grasp the meaning of the term from an investment standpoint, consider what a hedge does in your lawn. It sets a boundary or a limit. Likewise, an investment hedge sets a boundary in some way on the amount of loss. Unfortunately, many investors associate the term with the hedge fund. Although early hedge funds employed actual hedging strategies, the modern use is a general term for a specific type of pooled investment, which may manage money in a variety of ways and often employs strategies that are much more speculative than their earlier relatives bearing the same name! Hedging (not hedge funds) can be extremely important, especially for investors who have a large concentrated position they wish to maintain for tax or other reasons. Often options or other complex financial products will be used, although there are many ways to hedge depending on the specific situation. Rebalancing your portfolio on a regular periodic basis or when certain events occur can help to ensure that your portfolio continues to meet your risk profile and that you’re running the portfolio rather than letting it run itself. 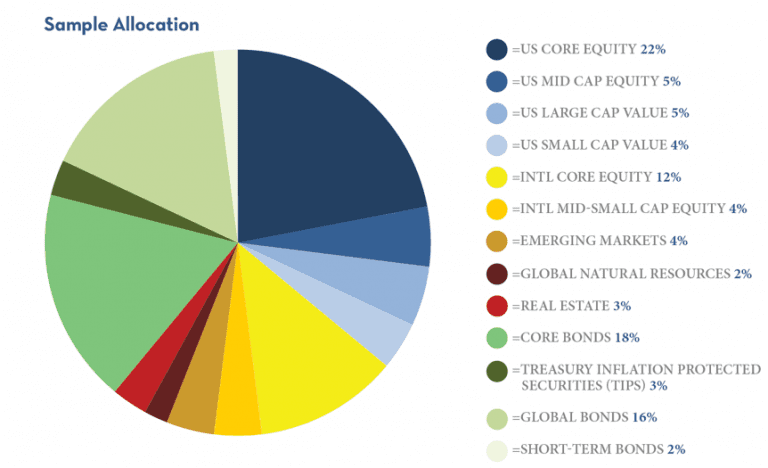 Imagine a very simple portfolio that is split between a stock fund and a bond fund, half in each. This might meet the preferences of someone with a moderate risk tolerance as opposed to the all-stock or all-bond portfolios of those with extremely high or low tolerances, respectively. Yet, what happens after the portfolio has been in existence for a while? If the stock market has performed well, you may have a greater percentage of your overall balance in stocks. Instead of a 50/50 split, you might now have a 60/40 split. The act of rebalancing gets you back to your target allocation, in this case, a 50/50 stock/bond mix. It does so by selling a portion of the stock position and buying additional bonds. There are many strategies for how and when to rebalance. Some prefer to rebalance with a certain frequency, such as annually. Others will rebalance once a certain percentage “range” has been exceeded. Some will use a combination of these techniques, perhaps rebalancing annually unless a target range has been exceeded, at which point an early rebalancing will occur. One technique that can make the act of rebalancing simpler and reduce taxes and transaction costs is to use known upcoming withdrawals or contributions to rebalance. If you plan to add to the account or make a withdrawal, choose the specific amounts that go to any investment based on your rebalancing goals. 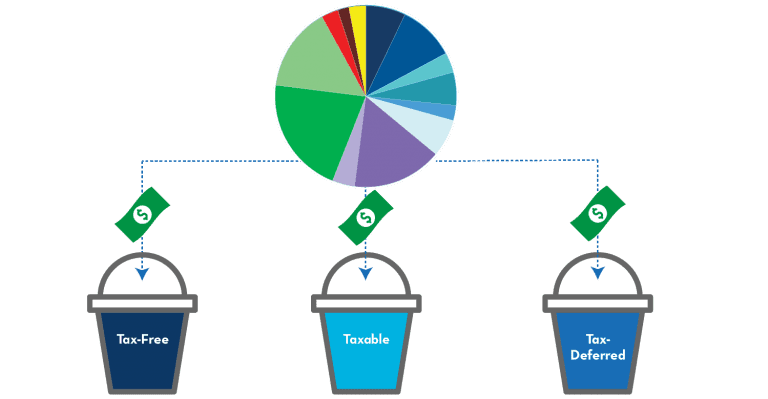 We could simply mention this unique type of diversification in our general diversification discussion, but those of you who have even attempted to do your own taxes in the past will probably agree that tax is such a complex topic that a separate section is warranted. The topic of tax diversification can ensure that you are able to keep as much of your return as possible. An example of the tax-free pool is the Roth IRA account. You do not get a tax deduction for contributing but later when withdrawals are made, the entire amount (including any growth!) is tax-free. 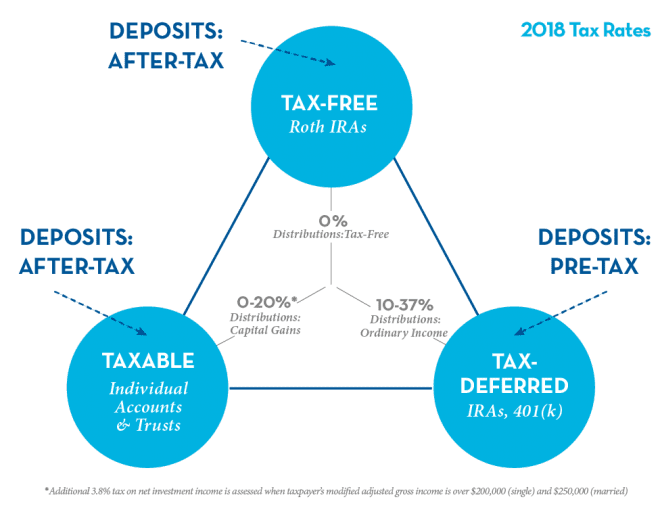 This differs from tax-deferred accounts, where a deduction is received when contributions are made, but the full amount of future withdrawals are included in taxable income. An example would be a traditional IRA or 401k. Taxable accounts, such as the non-retirement accounts you hold in your own name or jointly, are taxed at the investment rate for capital gains and dividends. This tax rate is more favorable than the ordinary income rate of taxation that applies to income such as your wages or withdrawals from deferred accounts. If you have money in more than one pool, you have greater flexibility when you make withdrawals. Are you in a low tax bracket based on your other income sources in retirement? You might be more inclined to withdraw income that is taxed at the ordinary income rate from your deferred accounts. Are you in a higher tax bracket in a specific year during retirement? Maybe making withdrawals from the Roth make sense at that point. These are very simple examples. Your tax situation in retirement may be more complex. At a minimum, you’ll need to also consider how your choices align with Social Security or other types of income you expect to receive during retirement. The bottom line is that diversification among all three pools of money allows you flexibility in making your decision during each year of retirement. As you can see, just as there are many types of risk, there are also many ways to manage it. The strategies we’ve discussed thus far are only some of the most common, but the list is by no means exhaustive. Depending on your specific investment needs, you may potentially benefit from one or more than one of these strategies. As your needs (and as a result of your investments) change over time, the strategies that make sense for your situation may change as well. Overall you should make sure to consider the importance not just of achieving a specific return but of managing your risk. You’ve worked hard and invested wisely to build the balance you have. Focusing on risk management principles can help ensure that you keep as much as possible.